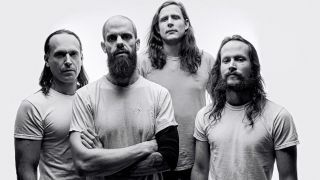 Baroness vocalist and guitarist John Baizley says they’ve begun writing material for their next album. The band dived into some of their older tracks during their set at last weekend’s Roadburn Festival – and Baizley says drummer Sebastian Thomson and bassist Nick Jost would like to incorporate some of what they learned in the lead up to their appearance into the follow-up to 2015’s Purple. Baizley exclusively tells Metal Hammer: “We’ve started writing a few tunes that we’re working on. The really cool thing now is that Sebastian and Nick have been in the band long enough that they understand what we do. “Preparing for Roadburn we had to learn some really old songs and in doing so they gained an understanding of that era of our band. Baizley curated this year’s Roadburn, bringing in bands including Magma, Wear Your Wounds, No Spill Blood and Youth Code. The Netherlands festival also included an exhibition of silkscreened poster art, which featured some of Baizley’s work – including his reimagined cover for Converge’s Jane Doe. Baroness will head out on the road again from next month. Find a full list of tour dates below. Baroness mainman John Baizley: "To love art is to love life"